Martin was speaking at the Fianna Fáil President's Dinner this evening. 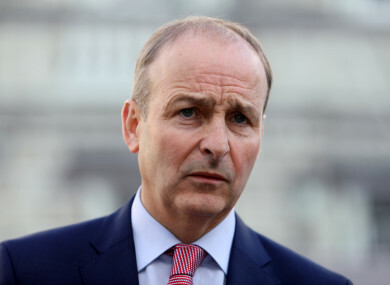 FIANNA FÁIL LEADER Micheál Martin has accused Fine Gael of seeking to destabilise their own government and told them not to give his party “any lectures about responsible politics or the need for stability”. It comes following bullish rhetoric from the Fine Gael Ard Fheis earlier today, where Tánaiste Simon Coveney saying “we are ready” for a general election. While Taoiseach Leo Varadkar ruled out an election before Christmas later on, he did reserve some stinging criticism for Fianna Fáil during his key-note speech. Both parties are in talks at the moment to try to secure an extension of the confidence and supply agreement, which has seen Fianna Fáil choosing not to vote against the minority Fine Gael government to get key votes through, such as the last three Budgets. In his speech at the Fianna Fáil president’s dinner this evening, Martin took a swipe of his own at Fine Gael, when referencing the housing crisis. “At times it has seemed that the more photographs we see of the Taoiseach and his favourite minister in hard hats the less they are actually doing,” he said. Martin also attacked the government’s record in areas such as the national broadband plan and health, saying that Varadkar had launched an “outrageous attack” on doctors, nurses and other frontline staff. On Brexit, Martin said that Fianna Fáil had committed not to bringing down the government because of the “very sensitive moment” currently in that process. “There has to be an urgent redoubling of Brexit preparations or we risk missing our opportunity to minimise the impact of the UK’s Brexit mess,” the Fianna Fáil leader said. Addressing party colleagues, he added that the party always “learns to respond to the challenges of new generations and we remain committed to this”. Email “Martin tells Fine Gael: 'Don't give us any lectures about responsible politics'”. Feedback on “Martin tells Fine Gael: 'Don't give us any lectures about responsible politics'”.